High blood pressure which is an important public health concern is responsible for 6% of deaths worldwide and can result in peripheral vascular disease, congestive heart failure, stroke, and end-stage renal diseases., Since high blood pressure can be asymptomatic, detection and treatment are essential especially among those with a high risk. Low physical activity, high stress level, smoking, high intake of saturated fatty acid and salt, as well as low intake of fruits, vegetables, and dairy products can increase the risk of hypertension. The consumption of dairy products due to high content of vitamin D, and calcium can lead to lower blood pressure. Since elderly population have low intake of vitamin D, limited exposure to sunlight, and insufficient capacity in their skin to produce vitamin D, different studies have suggested their high risk of deficiency and related complications. Since vitamin D intake can have some roles in reducing hypertension, the aim of this study was to assess the dietary intake of vitamin D and its relation with the mean systolic, and diastolic blood pressure among the elderly with and without nursing care. This cross-sectional study was conducted on the elderly with and without nursing care in Isfahan, Iran in 2017. Inclusion criteria were: non-smoking, age over 60 years, and no vitamin D supplementation. The elderly with care were selected from the elderly living in the centers and the elderly without care from the elderly referring to the center at the beginning of the entry. Overall, according to the sample size calculation with 95% confidence level, 152 elderly people were enrolled in the study, all of whom completed the consent form. This study was approved by the Ethics Committee of Isfahan University of Medical Sciences (Ir.mui.rec. 1395.1.200). Data about age, drug uses, number of chronic diseases, as well as mean systolic and diastolic blood pressure of each participant were extracted from their own medical file. Blood pressure was measured using a sphygmomanometer with an appropriate cuff. Weight was determined by a digital scale to the nearest 100 g and height was measured with a tape to the nearest 0.5 cm (without shoes). Eventually, body mass index was calculated by the formula (wt/ht2). The dietary intake of the elderly with and without nursing care was also evaluated by an expert nutritionist using the semi-quantitative food frequency questionnaire. The validity and reliability of the questionnaire used in the elderly population had been assessed in previous studies. The amount of consumption of each common food was determined which was converted to g/day by N4 software to measure the daily intake of each nutrient. Independent sample t-test and Chi-square test were used to compare the demographical data and vitamin D intake between the elderly with and without nursing care. Also, partial correlation test was used to determine the association between vitamin D intake and blood pressure adjusted energy intake among all participants. In addition, Kolmogrov-Smirnov test was used to confirm the normal distribution of variables. A statistical analysis was performed using SPSS (version 22) and P value less than 0.05 was considered as the significance level. In this study, 82 elderly with nursing care and 70 elderly without nursing care participated. The mean age, weight, height, body mass index of participants, and the percentage of male/females were 68.7 ± 5.5 years, 63.5 ± 7.9 kg, 162.5 ± 7.1 cm, 24.1 ± 3.4 kg/m2 and 48.7/51.3, respectively. Demographic data is presented in [Table 1]. Dietary intake of vitamin d among all participants is presented in [Table 1]. Also, intake of vitamin D among the elderly with care was higher than the elderly without care (P value = 0.003). Systolic blood pressure of the elderly with care was lower than in the elderly without care (P value = 0.007) [Table 1]. 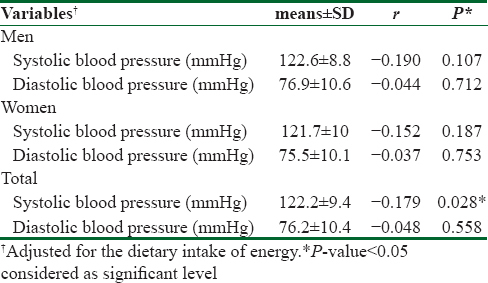 In [Table 2] it outlines partial correlation test related to vitamin D intake and blood pressure adjusted energy intake by gender and also in all participants. There was no significant correlation between vitamin D intake and blood pressure among men or women group. However, a significant negative correlation was found between vitamin D intake and systolic blood pressure among all elderlies (P value = 0.028, r = −0.179). In the present study, a significant negative correlation was observed between the intake of vitamin D and systolic blood pressure among all participants [Table 2]. However, this negative relationship was not further confirmed among elderly by gender. Other findings from the present study suggested that the intake of vitamin D was higher among the elderly under nursing care compared to the elderly without nursing care. Senescence is associated with a change in body composition, organ function, energy intake, and the ability to eat and access to food., The results of studies differed in the prevalence of nutritional problems and malnutrition across different situations (free living, under the care of the elderly or in hospitals). The results of Mokhber et al. showed that the prevalence of malnutrition in these individuals was 11.5% and the rate of elderly with high risk of malnutrition was 44%. Saka et al. also reported prevalence of malnutrition and individuals at risk of malnutrition among 181 outpatients from Turkey as 13% and 31%, respectively. Among the nutrients, vitamin D and calcium deficiency are considerable in elderly population. The study of Ter Borg et al. indicated that the dietary intake of thiamin, riboflavin, magnesium, and selenium were low among older adults in addition to deficiency of calcium and vitamin D.
After the age of 50 or 60s, increased blood pressure is mainly due to systolic blood pressure. Diastolic blood pressure increases spontaneously with age, while systolic blood pressure increases mainly due to functional and structural changes in arterial vessels. In the major arteries, aging causes contraction of calcium proteins, destruction and reduction of elastin, and increased number of collagen fibers. These age-related changes in systolic blood pressure are associated with cardiovascular disease and increased risk of death. Poverty, loneliness, and social isolation are the factors that reduce the intake of energy and malnutrition. In addition to low energy intake by the elderly who are deprived of health care, micronutrient and macronutrient intake is also lower. With changes in the concepts of aging and caring, the importance of food and nutrition in the prevention and management of illnesses in the elderly is highlighted. The relationships between appropriate nutrition services, positive health outcomes, and reduced health care costs for older people have been proven. Good nutrition and personal well-being in the elderly are beneficial to both the individual and the community. With improved health, dependency, hospitalization, and the time it takes to recover from the illness are reduced. Indeed, desirable nutrition plays an important role in the health of the elderly. Various mechanisms have been proposed for the effect of vitamin D on blood pressure, one of which is the renin-angiotensin system. Renin-angiotensin system seems to be one of the most important contributors to systolic blood pressure. Studies in animals have shown that 1,25-dihydroxyvitamin D reduces renin gene expression by a mechanism that is bound to the vitamin D receptor and thus reduces blood pressure. Vitamin D can also exert antihypertensive effects through different molecular mechanisms. Vitamin D indirectly regulates the magnitude of calcium absorption from the intestine and interacts with parathyroid hormone which is related to blood pressure in directly. Cross-sectional studies have reported contradictory results regarding the intake of vitamin D in people with hypertension. Snijder et al. investigated the relationship between serum 25-hydroxyvitamin D [25(OH)D], as well as PTH levels and blood pressure in elderly men and women. In this study, serum 25(OH)D was not associated with blood pressure. However, a wider study of 15,000 Norwegian men and women aged 25-69 years did not show any significant correlation between the intake of vitamin D and blood pressure. Also, in a combined study of three cohort studies, out of a total of 20,913 participants, including elderly men and women, no significant effect was found by high levels of vitamin D in reducing the risk of hypertension. However, the present study showed a significant inverse relationship between vitamin D intake and systolic blood pressure among all participants. Mendelian randomization study evaluated the relationship between the 25(OH)D concentration and blood pressure and risk of hypertension. According to the results of this study, the risk of hypertension diminished following elevation of plasma concentrations of 25(OH)D. Another study found an inverse association between 25(OH)D and all-causes and cardiovascular disease mortality in healthy adults with serum 25(OH) D levels of ≤21 ng/mL. Concerning the strengths of the current study, the results obtained regarding the intake of vitamin D is valuable thanks to controlling the confounding variable of energy intake. The weakness of this study was the relatively low number of participants, which may have affected the outcomes. Therefore, more extensive studies with larger sample sizes are proposed for the future research. The results of this study indicated that the dietary intake of vitamin D had a negative correlation with the systolic blood pressure in the all elderly. In addition, dietary intake of vitamin D was high in the elderly group under nursing care, while systolic blood pressure was low in this group. Since lack of attention to dietary care in the elderly population is prevalent, diet and lifestyle health care can improve intake of vitamin D, which can result in lower blood pressure. Accordingly, more studies should be conducted in the future to confirm the results of our study. This article is part of a research project registered at the Isfahan University of Medical Sciences (195200) and sponsored by the university. We thank the all the people participating in this study. Bravo MF, Gallo F, Marchello C, Boicelli R, Lupi S, Atzei M, et al. Assessment of malnutrition in community-dwelling elderly people: Cooperation among general practitioners and public health. Iran J Public Health 2018;47:633-40. Win AZ, Ceresa C, Arnold K, Allison T. High prevalence of malnutrition among elderly veterans in home based primary care. J Nutr Health Aging 2017;21:610-3. Bosu WK, Aheto JM, Zucchelli E, Reilly S. Prevalence, awareness, and associated risk factors of hypertension in older adults in Africa: A systematic review and meta-analysis protocol. Systematic Reviews 2017;6:192. Wolf-Maier K, Cooper RS, Kramer H, Banegas JR, Giampaoli S, Joffres MR, et al. Hypertension treatment and control in five European countries, Canada, and the United States. Hypertension 2004;43:10-7. Ong KL, Cheung BM, Man YB, Lau CP, Lam KS. Prevalence, awareness, treatment, and control of hypertension among United States adults 1999-2004. Hypertension 2007;49:69-75. Reddy KS, Katan MB. Diet, nutrition and the prevention of hypertension and cardiovascular diseases. Public Health Nutr 2004;7:167-86. Wang L, Manson JE, Buring JE, Lee I-M, Sesso HD. Dietary intake of dairy products, calcium, and vitamin D and the risk of hypertension in middle-aged and older women. Hypertension 2008;51:1073-9.
de Jongh RT, van Schoor NM, Lips P. Changes in vitamin D endocrinology during aging in adults. Mol Cell Endocrinol 2017;453:144-50. Li YC, Qiao G, Uskokovic M, Xiang W, Zheng W, Kong J. Vitamin D: A negative endocrine regulator of the renin-angiotensin system and blood pressure. J Steroid Biochem Mol Biol 2004;89:387-92. Holt PR. Intestinal malabsorption in the elderly. Dig Dis 2007;25:144-50. Fernández-Ballart JD, Piñol JL, Zazpe I, Corella D, Carrasco P, Toledo E, et al. Relative validity of a semi-quantitative food-frequency questionnaire in an elderly Mediterranean population of Spain. Br J Nutr 2010;103:1808-16. Saka B, Kaya O, Ozturk GB, Erten N, Karan MA. Malnutrition in the elderly and its relationship with other geriatric syndromes. Clin Nutr 2010;29:745-8. Khazaei Z, Khazaei S, Beigrezaei S, Nasri H. Vitamin D deficiency in healthy people and its relationship with gender and age. J Parathyr Dis 2018;6:16-8. Mokhber N, Majdi MR, Ali-Abadi M, Shakeri MT, Kimiagar M, Salek R, et al. Association between malnutrition and depression in elderly people in Razavi Khorasan: A population based-study in Iran. Iranian J Pub Health 2011;40:67-74.
ter Borg S, Verlaan S, Hemsworth J, Mijnarends DM, Schols JM, Luiking YC, et al. Micronutrient intakes and potential inadequacies of community-dwelling older adults: A systematic review. Br J Nutr 2015;113:1195-206. Pepe S, Lakatta EG. Aging hearts and vessels: Masters of adaptation and survival. Cardiovasc Res 2005;66:190-3. O'Rourke MF, Safar ME. Relationship between aortic stiffening and microvascular disease in brain and kidney: Cause and logic of therapy. Hypertension 2005;46:200-4. Katherine L, Buranapin S. Nutrition and aging in developing countries. J Nutr 2001;131:2417-23. King FS, Burgess A, Quinn VJ, Osei AK, editors. Nutrition for Developing Countries. Oxford University Press: Oxford Publishing; 2015. Liu FX, Botteman M, Patel DA, DeLegge MH, Mercaldi CJ, Turpin RS. Cost effectiveness analysis of parenteral nutrition therapies among hospitalised patients: Multi-chamber bag system vs. compounding. Int J Healthcare Technol Manag 2014;14:176-93. Allard JP, Keller H, Jeejeebhoy KN, Laporte M, Duerksen DR, Gramlich L, et al. Decline in nutritional status is associated with prolonged length of stay in hospitalized patients admitted for 7 days or more: A prospective cohort study. Clin Nutr 2016;35:144-52. Cabrera-Sole RM, Rivera LU, Lucas CT, Salazar DC, Saldaña MA. Isolate systolic hypertension and central pressures in elderly patients. Differences between men and women with similar peripheral pressures. J Am Soc Hypertens 2016;10:e2-3. Larsen T, Mose FH, Bech JN, Hansen AB, Pedersen EB. Effect of cholecalciferol supplementation during winter months in patients with hypertension: A randomized, placebo-controlled trial. Am J Hypertens 2012;25:1215-22. Mutt SJ, Karhu T, Lehtonen S, Lehenkari P, Carlberg C, Saarnio J, et al. Inhibition of cytokine secretion from adipocytes by 1,25-dihydroxyvitamin D (3) via the NF-κB pathway. FASEB J 2012;26:4400-7. Jeong HY, Park KM, Lee MJ, Yang DH, Kim SH, Lee SY. Vitamin D and Hypertension. Electrolyte Blood Press 2017;15:1-11. Snijder MB, Lips PT, Seidell JC, Visser M, Deeg DJ, Dekker JM, et al. Vitamin D status and parathyroid hormone levels in relation to blood pressure: A population-based study in older men and women. J Intern Med 2007;261:558-65. Jorde R, Bonaa KH. Calcium from dairy products, vitamin D intake, and blood pressure: The Tromso study. Am J Clin Nutr 2000;71:1530-5. Forman JP, Bischoff-Ferrari HA, Willett WC, Stampfer MJ, Curhan GC. Vitamin D intake and risk of incident hypertension. Hypertension 2005;46:676-82. Vimaleswaran KS, Cavadino A, Berry DJ, Jorde R, Dieffenbach AK, Lu C, et al. Association of vitamin D status with arterial blood pressure and hypertension risk: A mendelian randomisation study. Lancet Diabetes Endocrinol 2014;2:719-29. Amer M, Qayyum R. Relationship between 25-hydroxyvitamin D and all-cause and cardiovascular disease mortality. Am J Med 2013;126:509-14.